Hey there. 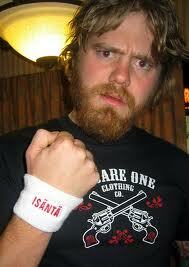 News broke out this morning that Jackass star, Ryan Dunn, was killed in an early morning car accident. Many didn't believe it. Especially in this digital world where anything said via Twitter or Facebook can spread like the plague. False stories of celbrity deaths seem to be the norm nowadays. Unfortunately, that was not the case with Ryan Dunn. It's been confirmed and there are pictures floating around the web. 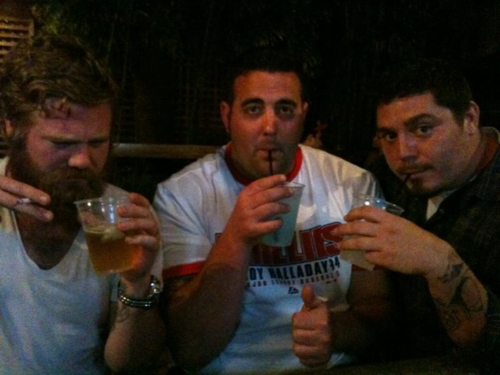 Yup, that's him drinking with his buddies the night before he died. He posted that picture on his Twitter feed. I really hope that he wasn't behind the wheel when the accident went down. Considering that he's a celebrity (no matter how small) you should be able to get a cab to take you home. The dude was fun loving, funny as hell, and seemed to be all around awesome guy. Though he was known more for his Jackass antics, I watched Ryan on G4's Proving Ground. We has witty and funny and seemed the perfect host as the "Prankster". Instead of doing insane Jackass stunts, he spent the show trying to recreate great moments of movies, comics, and video games in real life. No one is perfect and we all make mistakes. It an autopsy reveals that there was high alcohol content in both of them, it's one huge mistake that made this world a little less brighter and a little less funnier. RIP, my friend. Later. Tell me about it. Jeff Goldblum's has tasted death like 5 times already. Well.... according to Twitter. I didn't believe it either. It's really hard to tell nowadays what to take seriously. Sad day for the Jackass family.